Blessings of Noble Triple Gem and Protection of All Celetial Beings for all the Olympic athletes, visitors, officials and workers, the Countries and London! Dhamma Nikethanaya Buddhist Cultural Centre for Education Meditation Psychotherapy & Counselling, based in Letchworth Garden City extends heartfelt congratulations with blessings of Noble Triple Gem to all at London Olympic 2012 for a happy, successful & peaceful event of Celebration. Venerable Akurala Samitha, head of the centre together with some members of the meditation group of Dhamma Nikethanaya community joined a PRAYER VIGIL for PEACE on Saturday 09th June 2012 at the start of the "100 DAYS of PEACE – OLYMPIC Truce" organized by St. Andrew Church in Hitchin. 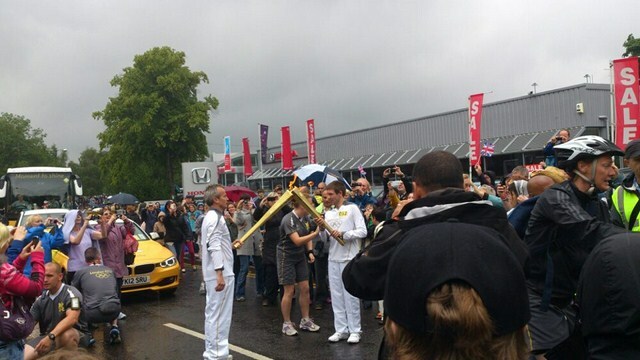 Blessings and meditation were dedicated for all the Olympic athletes, visitors, officials and workers, the Countries and London in a beautiful outset of a walking circle of all the flags. 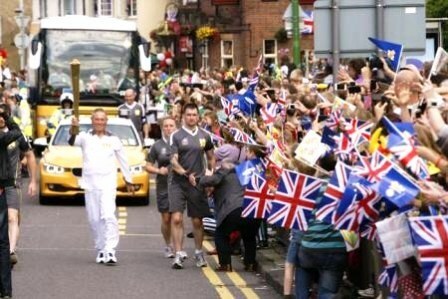 The 81-year-old, Mr John Eastwell was the one and the only local resident of Letchworth Garden City to be appointed by Sports England to carry the flame through on Sunday 08th July 2012 in respect of his outstanding voluntary contribution towards the community. He is a member of North Herts Bowls Club, Salvation Army and also a friend of Venerable Akurala Samitha and Dhamma Nikethanaya Community. He recently received the Volunteer of the Year Award and a Lifetime Achievement Award at the 2011 Herts Sports Partnership's Service to Sports Awards. By sharing the spirit of the experience with Venerable Samitha he said "It was once in a lifetime experience. Community support was overwhelming. It was simply amazing." 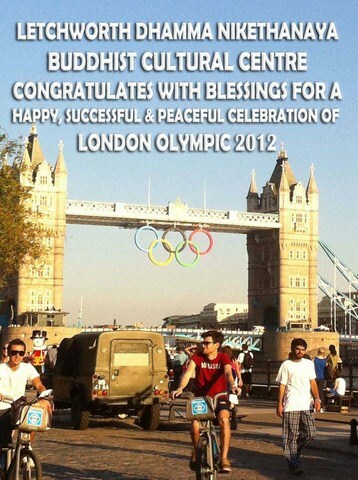 Dhamma Nikethanaya Buddhist Cultural Centre wishes a Successful & Peaceful Celebration of London Olympic 2012 to all! Letchworth Dhamma Nikethanaya Buddhist Cultural Centre Congratulates with the Blessings of Noble Triple Gem for a Happy, Successful & Peaceful Celebration of London Olympic 2012 to All!